(HOST) International relations have always been complicated, and never so much as in the years since September 11th. 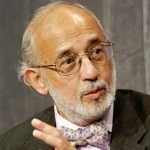 Sarwar Kashmeri of Reading is a senior fellow of the Atlantic Council’s International Security Program. He’s also a VPR commentator. He says that last night’s news of bin Laden’s death brought unusual clarity to foreign affairs, at least for a brief moment. (KASHMERI) How does one react to the death of Osama Bin Laden? For me it was a sense of closure. Closure of a chapter that began on 9/11 as I watched the horror that was perpetrated on New York and the country. I couldn’t get into Manhattan that day, to my office; it would be the next day before I could do that. My first act was to walk all the way to where the towers had stood, or as close as the police would let me. I wanted to see for myself the towers were gone, and those horrible pictures on television weren’t some kind of cruel joke. Later things became more complicated as all of us started to understand the extremist, terrorist group that had decided to declare war on the civilized world. And then the wars came. The unending and in some cases unnecessary wars. With all those brave American women and men who marched off to do the country’s bidding. In spite of the valor and dedication and training, not much seemed to be accomplished. The wise men told us winning and closure may not be possible in today’s complicated world any more. The weeks spun into months, the months into years, the years into a decade and a numbness set in with the feeling that these expeditions would go on and on forever without end. That decade of uncertainty ended last night with the announcement of Osama Bin Lauden’s death. With a finality that was contagious the President stepped before his lectern and informed America and the world that the man who was responsible for inspiring the mayhem of the last 10 years, a man who falsely claimed to murder for God, was dead. Then, in a signal with huge meaning in the Muslim world, in deference to Bin Laden’s Muslim faith which requires burial within 24 hours, his body was lowered into the sea. An act explicitly permitted in Islam. To me there is no more eloquent picture of who we Americans are as a people? For too long America has been in a depressed, vacillating state. That state ended at midnight yesterday when totally unrehearsed, throngs of people gathered outside the White House, cheered, sang the national anthem – when Times Square in NY became the venue for impromptu celebrations, and hundreds of people wandered over to the emptiness of where the World Trade Center towers used to stand. There’ll be enough time to think about the deeper foreign policy implications of the killing of Bin Laden, how it affects the U.S. Pakistan relationship, the Pakistan Afghanistan relationship, and so on.